Nicholas’s boots rested by the hearth, ice melting on their toes. The saint himself sat nearby at the table, his belt unbuckled, his long fur robe falling open at his waist. He reached forward and raised a steaming mug of cider in the direction of the opposite chair. A grin appeared in the shadows at the far side of the table. “Here’s to another year’s work almost done,” said Nicholas. His companion’s red eyes narrowed. “Almost?” asked the Krampus. Krampus’s forked tongue darted out, licking sweet liquid from the rim of his cup. “And what is that?” he asked. From his nearly empty sack, Nicholas withdrew one last parcel wrapped in bright paper. Nicholas’s snowy eyebrows bunched together. “What are you talking about?” he asked. Author’s Note: This short-short was written just after the first Krampusnacht: Twelve Nights Of Krampus anthology was published in 2014. I’d had so much fun working on my piece for that book, “A Krampus Carol,” that I just couldn’t resist spending a bit more time with the character. 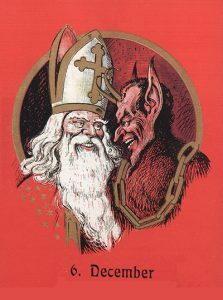 Although, in this story, the Krampus is a bit more articulate and thoughtful regarding his role, as well as that of his more famous counterpart. I hope you enjoy spending a bit more time with the two of them as well. Treu dem guten alten Brach! Gruss vom Krampus! For more Krampus-y goodness, get your own copy of Krampusnacht: Twelve Nights of Krampus, available from Amazon in print or Kindle format.